Whether by choice or mandate, the past fifteen years have brought changes to the formulas of our two most popular liquid fuels. In the century-old market for diesel fuel, soy based alternatives became available. Reasons for offering non-hydrocarbon diesel alternatives were several. Soy fuels promised equal or better engine performance, fuel economy, reductions in soot, smell, nitrous oxide and carbon dioxide emissions. 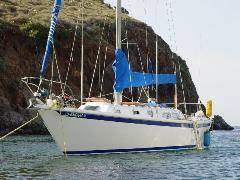 Since my only diesel engine was in WindSong, our 1970 Ericson sailboat, I began adding about one-third bio-diesel during each fill up. Later in this article, I will discuss my results. In the U.S. gasoline market, ten percent alcohol, derived from corn became mandatory. Today, the liquid fuel we put in our automotive and small engine fuel tanks barely resembles the gasoline of the 1960s. Since then, we have eliminated lead, added and then removed MTBE, added and retained up to ten percent corn alcohol to the blend. In order to distance "corn alcohol" from "demon rum", it was repositioned as "ethanol". The ostensible reasons for adding ethanol to our gasoline are similar to the arguments for biodiesel. On several accounts, that story falls short. On the engine performance side, alcohol burns more cleanly, but is highly corrosive, while attracting both dirt and water. It does not have higher octane, and therefore it does not provide better performance. Since it carries less energy per gallon, it robs, rather than improves fuel economy. With two strikes against ethanol, how did our farm-state legislators pass a mandate to put their produce in our fuel tanks? Simply put, they played the “foreign oil card”. After all, we grow the corn here in America, so a ten percent reduction of foreign oil input to our gasoline could help decrease our dependency on unreliable or expensive producers, like the Middle East. The only problem with using corn to create “homegrown fuel” is that it takes more energy input to deliver it than we get out of it when we burn it. When you figure the cost of growing, processing and transporting corn, and the alcohol thus derived, it becomes clear that the corn-fueling program is nothing more than a farm subsidy. Even at $5.00 per gallon, it is still less expensive to import and refine oil than it is to create corn fuel. Since consumers pay that extra tariff at the pump, they do not perceive it as a tax. Hello, Tea Party... If you are looking for a tax to eliminate, how about the Midwest corn fuel tax? Of all the plants suited for alcohol production, corn is one of the lowest on the list. When the G.W. Bush Administration started talking about “switch grass” as a better alternative to corn, I knew something is fishy. Of all available plants, the dreaded and ill-fated hemp plant may have the greatest potential. Since the federal government classifies the more esoteric forms of that "weed" as a narcotic, it may be a while before we positive developments there. In the biofuel market, corn is cute but hemp is just plain ugly. Sometimes ugly can be more effective than cute. Speaking of ugly, what corn fuel can do to a small gasoline engine is definitely not cute. If you let gasoline sit in the tank of an outboard motor or lawn mower, it will transform, leaving a varnish that will permanently plug any fuel system. With the ongoing American love affair with automobiles, we drive enough for the corn alcohol to cycle through our engines before it can gum up the works. With a small engine, lack of use leads to clogged fuel systems. 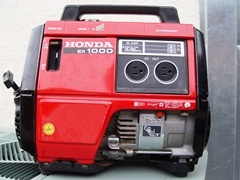 My 1980's Honda EX1000 generator is a perfect example. Several years ago, I allowed gasoline to sit in its tank for months. After that, I could start the engine, but it surged constantly as it ran. After servicing it, a local mechanic simply told me to start the engine every couple of months. Later, I again let the generator sit unused for several months. After that, I could get it to start using ether as a starting fluid, but only for a few moments. A visit to Moab Small Engines & Welding yielded the answer to my question. “It’s the ethanol”, the proprietor told me. After he cleaned the carburetor and fuel line, I was on my way, but with a better set of instructions. He told me to keep a minimum of fuel in the Honda EX1000. After an RV trip, I was to drain the tank and then run the engine dry. As extra insurance against ethanol residue, I was to loosen the gas cap. That way, any remaining fuel would evaporate before it varnished the fuel lines or carburetor. Regarding the biodiesel on WindSong, I wish that the solution were as simple. When I last ran the engine, a molasses-like sludge from the fuel tank pumped all the way through the system, stopping just short of the delicate fuel injectors. The sludge was like nothing that my fuel specialist, Mr. Dwyn Hendrickson of Marina del Rey, California had ever seen. With ten dollars per gallon disposal fee, that alone cost one hundred dollars. His total bill was $850, but well worth it. With a broken electric fuel pump, two clogged fuel filters and sludge in the fuel lines, my spotty engine usage and delayed oil change turned into a complete cleaning and rebuilding of the fuel delivery system. I do not wish to demonize either ethanol or biodiesel. Each has its place, although I would rather pay Midwest farmers their ransom via my taxes than in my engine maintenance costs. To this day, no one has the nerve to suggest that we mix ethanol into our aviation fuel. Airplanes falling from the sky might make this problem obvious to all. If each of us burned quickly through our supply of biodiesel, rather than letting it rot in our tanks, it could be a good fuel. With regular usage, it is an environmentally friendly alternative to old-fashioned hydrocarbon diesel. If there were greater transparency about hidden costs, motorists and casual boaters might demand better alternatives to the “alternative fuels” now available. I wonder if clean coal or tar sands might hold the answers that we seek.